That life should be about the journey and not the destination is a philosophy we all agree upon, and yet few of us practice. But to travel to the Maldives is to truly live a journey. From the moment you spot the rings of sapphire from your window seat to the first wide-eyed boat ride across the warm lagoon. This is a journey that makes you feel alive. So why not make it last the whole trip? The Maldives is best known for its tiny – but perfectly proportioned – resorts, situated on islands that make up less than one percent of the county. 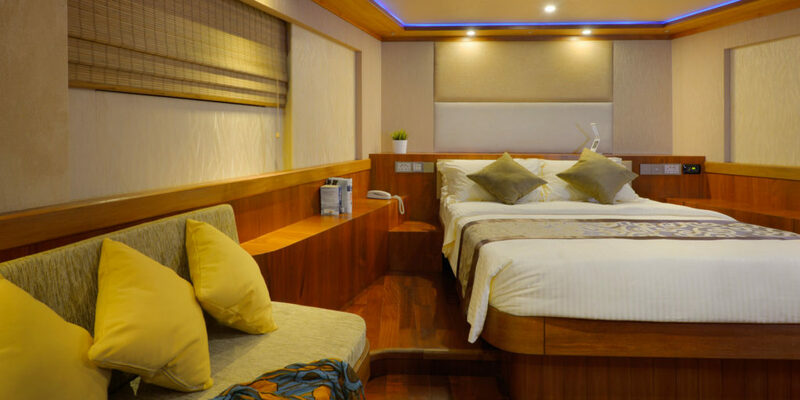 But for those who wish to experience the true expanse of the atolls, scores of safari boat vessels are happy to take you on a journey around the other 99 percent. 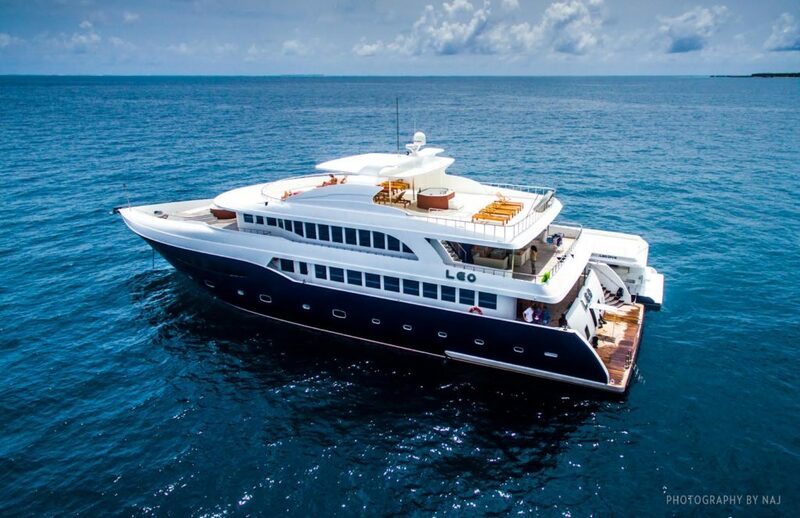 The yacht ‘Leo’ and her crew can ensure that your journey to the Maldives is one unencumbered by destination, allowing you to soak up all that the Indian Ocean has to offer, in the lap of luxury. 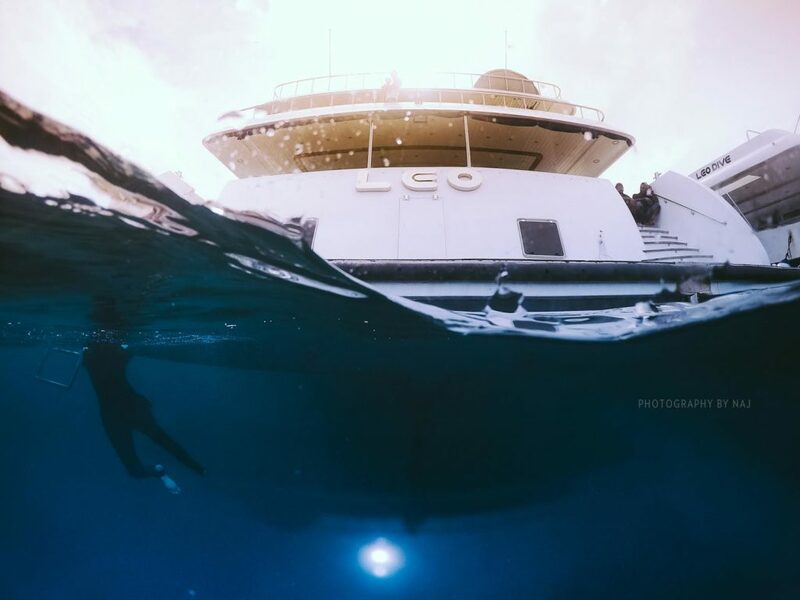 From the airport, guests take a medium-sized journey in Leo’s dhoni, the ‘Leo Dive’, to the harbour in Hulhumale’ to their vessel – 40ft ‘of-no-fixed-abode’ which will comfortably accommodate 22 travellers. After welcome drinks and a tour of Leo’s decks, the big journey can begin, with the captain happy to tailor the voyage to suit whatever it is you want to see. Dive sites, manta rays, sharks, uninhabited islands in far flung atolls – all can be worked into an itinerary as broad as the flawless horizon. 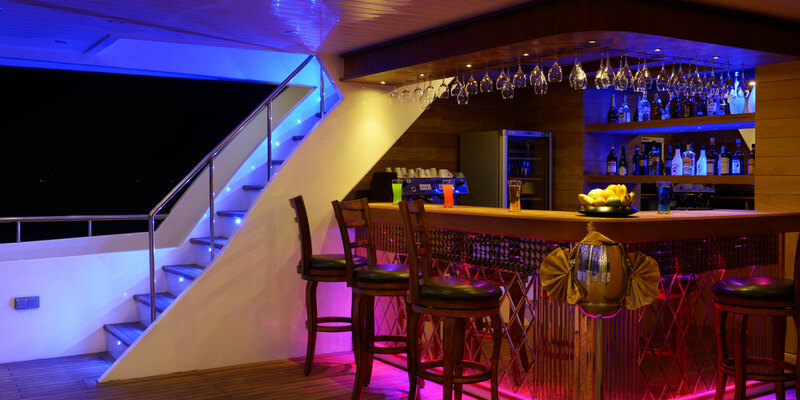 The journey from Male’ can include cocktails at the bar on the upper levels, a ride in the jacuzzi on the top deck, or reclining on the bow’s outdoor lounge – where you can survey your surroundings as the sea breeze stays the tropical heat. Once away from the boat traffic and buzzing seaplanes of the capital, the stillness of the lagoon makes itself known as the engines die down and the anchor brings the big journey to a momentary pause. More medium-sized trips can now be made to the reef for diving and fishing on the faithful ‘Leo Dive’, which travels alongside. PADI trained dive instructors on board can prepare you for vertical expeditions to the Maldives’ lower reaches. Even smaller trips can be made for snorkelling or to lonely sandbanks on Leo’s small speedboat (unnamed, but let’s call him ‘Leo Jnr’), which is towed behind. After a day spent viewing the fish on the reef, it would be rude not to invite a few on-board for one of the three sumptuous meals served daily. With the abundance of marine life, even the least skilled fisherman will eventually feel the pull of a new guest at the end of the line. 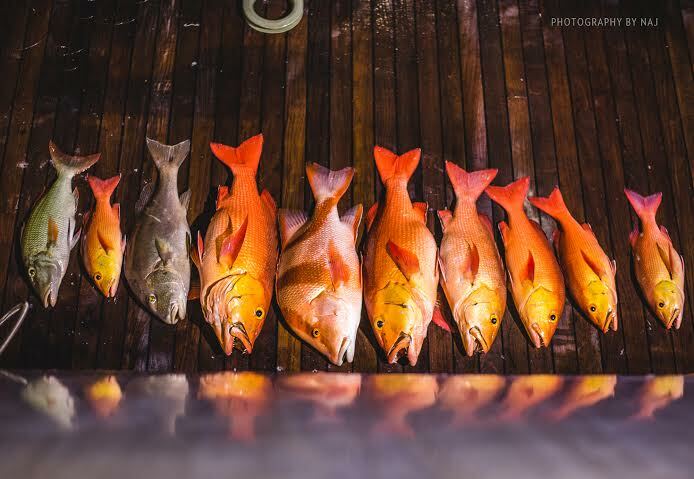 Red snapper, barracuda, and jackfish are the main prizes, and can often be caught from the back of boat (though you’ll need to put down the drink for the bigger ones). The more pliant mushimas fish are always willing to provide consolation for those who don’t catch bigger game, but an evening spent gazing out over the lagoon under the stars is its own reward. Returning to the yacht, the crew will be busy laying out the evening meal, most often consisting of fish that (you don’t need telling) is as fresh as it gets. 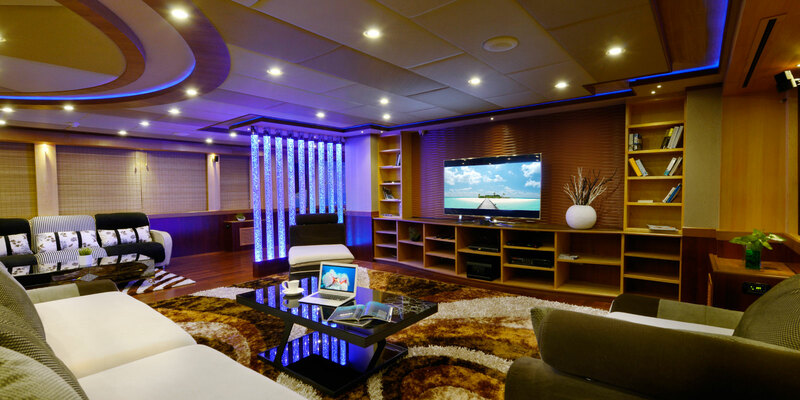 In the evening, the Leo is transformed into a floating cinema, and guests are encouraged to bring their own film collection to enjoy in HD comfort. Perhaps Finding Nemo or the Little Mermaid, but maybe not Jaws. (You’ll have a good chance of finding Nemo on tomorrow’s trip; the other two, not so much). Heading to your cabin, you can plan tomorrow’s journey. Up early for a morning swim, picnics on a deserted islands, or visiting a small island community – anything is possible. As your head hits the pillow, the mild currents rock you off to sleep, and the journey continues.